If you were to pick up a newspaper today, you would no doubt feel a sense of trepidation towards the economic outlook for 2019. Mark Carney of the Bank of England last week spelt out the economic dangers of a hard Brexit, with risks of a 25% devaluation of the pound, inflation up to 6.6% and a shrinking economy by up to 8%. The papers responded with their usual level of restraint. It makes us wonder what people expected of a possible hard-exit with the UK’s largest trading partner. Growth? Whilst Mark Carney has spelt out the worst case scenario, we think this view is overly pessimistic. But there is no doubt that whatever the outcome of the Brexit debacle, certain balls have started rolling that will not return soon. For example, up to 37 banks and financial firms will be shifting their business to mainland Europe, with a loss of £700Bn of financial assets in Q1 2019 to Frankfurt alone. Banks, insurers and other financial services companies are in a race against the clock to clinch licences and bolster their continental workforces before Britain leaves the EU. And manufacturers with large capital investments in the UK such as Nissan will seriously re-consider where they place future investment. Companies such as Schaeffler have already begun their shift, in part due to the uncertain outlook. So if you are considering selling your UK Company in 2019, what should you be thinking? Let’s first take a look at the UK M&A / business transfer market performance in 2018. 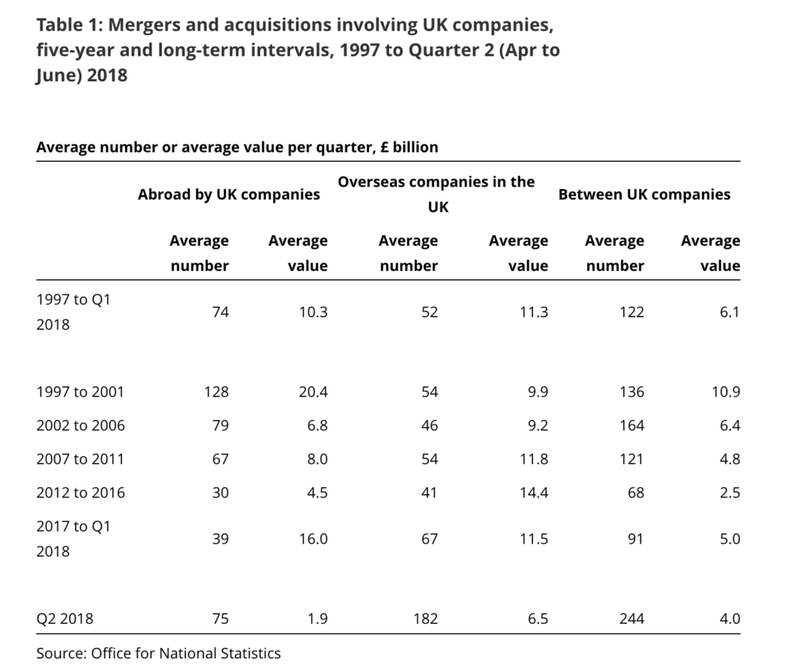 The number of acquisitions in the UK by foreign companies in Q1 & Q2 appears to have increased significantly, albeit this is partly due to new methods of reporting smaller M&A transactions (a notable weakness on prior years reporting which tended to highlight only the larger transactions). 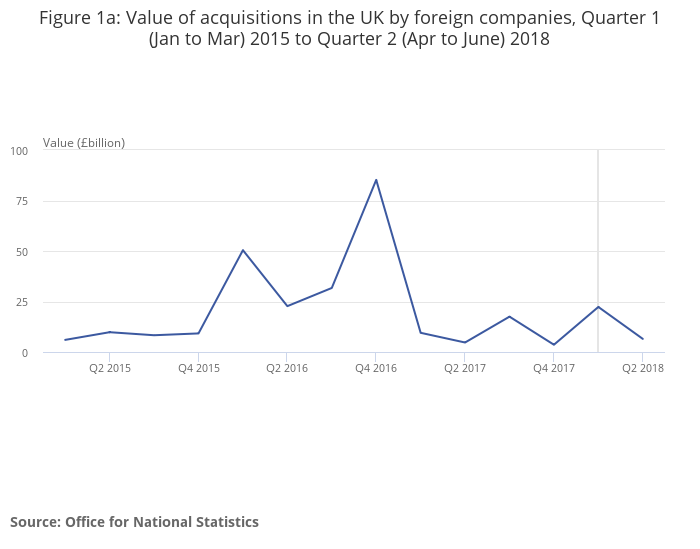 Despite an apparent uptick in volume of transactions in the UK by foreign companies, the overall value decreased by £15.8Bn when compared with the value of £22.3Bn seen in Q1 2018. This can be partly explained by fewer transactions above £1Bn – and newer recording of smaller transactions. 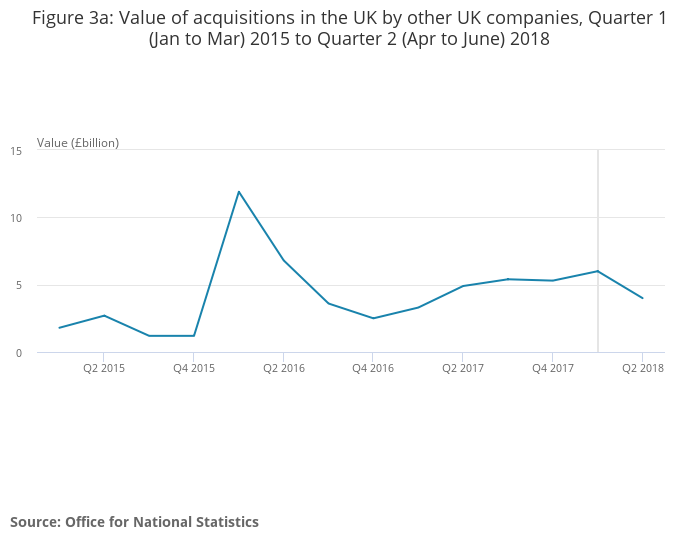 The value of domestic acquisitions (UK to UK) weakened from £6Bn (Q1) to £4Bn (Q2), however looking at the period since 2012, the run-rate appears average if one strips out the blip driven by only a few large transactions in 2015-16. What can we unpick from this data? The first point is that deal making did not stop during the 2008 financial crash. In fact, the average number of transactions involving foreign buyers continued largely unabated from 1997 – 2016. 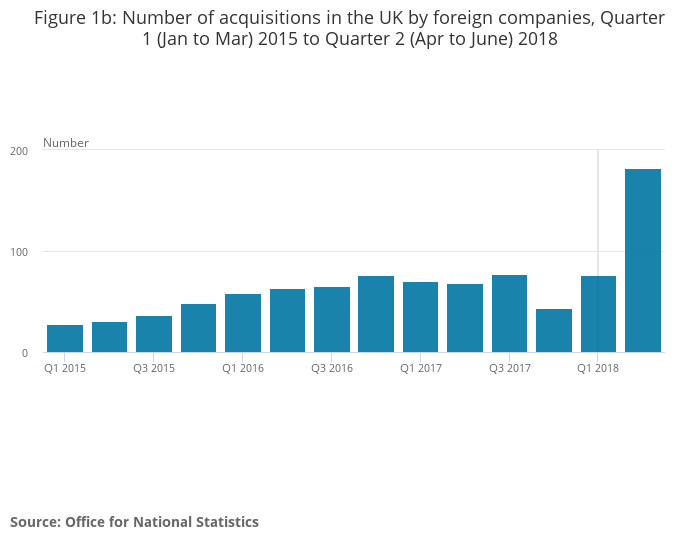 The number of UK – UK transactions however dipped significantly during 2012 – Q1 2018. The second point to note is the Q2 2018 numbers have shown a quantum increase right across the board. This is due in part to a new reporting system that now captures smaller M&A deals. Our boutique M&A business has seen a record year in 2018 – and speaking to M&A professionals, lawyers and accountants, our experience seems to mirror what has been a busy year for many. So what can we expect from 2019? Transactions in the UK will continue in 2019 at a moderate pace, particularly in the SME sector. Inward investment in the UK has never been cheaper. With the pound trading at USD $1.27, this is a 5 year low from a USD $1.65 in 2013. For overseas investors taking the long view, UK companies are particularly attractive to overseas investors right now. The UK is ranked the world’s number 5 in terms of GDP. Despite a potentially difficult Brexit, this is unlikely to materially affect GDP by more than 5% over a medium term period. Whilst the relative shift in income matters on the ground, the fact is, the UK will remain a significant contributor on the world-stage for decades to come. Not wishing the mention the B-word once more – but should the exit be harder than planned, fiscal stimulus from the Bank of England is likely to be robust which works in the long term favour of companies investing in the UK. The UK has a considerable number of ‘grey-companies’ within the SME sector, many with little in the way of succession planning. These companies are owned by individuals aged between 50 – 85 and without an obvious succession route, many will need to find a new home at some point, whether by trade exit, financial sponsorship (e.g. Private Equity) or by way of Management Buy-In (MBI) or Management Buy-Out (MBO). The UK continues to be a global leader in Technology. For example, the digital sector is growing twice as fast as the economy as a whole. Tech Nation 2018 reported that London was rated at 3rd in the global tech start-up ecosystem, just behind Silicon Valley and New York. Technology firms will continue to be a key driver of economic growth and will remain attractive to mergers and acquisitions. So despite a gloomy rhetoric delivered by mass media, our view is that 2019 will continue to be a reasonable year for M&A transactions within the SME market! For source data on UK M&A transactions, please click here. To download the report on UK Technology, please click here.